Since my last post was in October, it won’t be difficult to believe I have been busy. Much of my time has been spent on radio stuff. I have however been working with Emergency Management in the Community Emergency Response Team. CERT is a program designed by FEMA/DHS and administered at the local level by a sponsoring agency. In Klamath County, it is sponsored by Emergency Management. I have signed up to be a part of CERT, but the training sessions are infrequent and movement through the application process has been slow. When I’m not working on CERT stuff I can be found working on Club or EmComm projects. With the club, Klamath Basin Amateur Radio Association, I have been setting up the packet network and learning as much as I can about packet nets, the hardware, and software associated with packet. Packet has consumed much of my time the last few months between getting the infrastructure up and running, expanding it, and fine-tuning things. Since moving up here I have not had nearly as many opportunities to participate as a Volunteer Examiner. I miss doing two VE sessions a month. Recently I received an appointment as a Field Examiner and as a Field Instructor. These appointments are for EmComm instruction and certification. I am hoping to get some classes going which would increase the number of VE/FE exams. The other major consumer of my time has been EmComm. As the EC I have been tasked with getting the ARES/RACES program running. Since there was nothing here in the first place, I have been starting from scratch. Getting the internal county administrative stuff has proven to take the longest. Another huge time consumer has been writing the Standard Operating Guidelines and the Training Manual for the county’s ham radio program. While administrative things are still not finalized, the county EmComm program will be organized as an AUXCOMM program with ties to ARES for expediency in working with other counties teams. One thing that has had some great forward movement is the NTS program I have been setting up. We started with a voice net on the basin’s primary repeater twice a week. It has been going well and we have built up a roll of regulars over a dozen with an average of 5-6 check-ins each net. We recently expanded to a second net on the secondary repeater after the first net. Now we are adding a VHF packet net after the second voice net. I have plans to add an HF voice and HF digital net to the lineup soon. My own participation in digital as of late has been centered on VHF packet and HF Winmor with Winlink CMS. Now that the station is functional for HF voice and digital, as are the VHF/UHF voice and packet stations. The packet station is an Alinco DR135 and a KPC3+ USB connected to a second Diamond X50A. I keep the station on 24/7 with the radio set at 5 watts. Overall it has very low power consumption. I have no trouble reaching the digipeaters and I have a regular visitor from Shasta CA checking in on KK6GXG-1. I have also been able to get all the way down to the bay area via several other digipeaters. I have made a few VHF connections to the Winlink CMS system as well. The VHF/UHF voice station is a Yaesu FT-2500M connected to a Diamond X50A. The two antennas are about the same height and separated by about 15 feet. For repeater communication, I usually have the power down to 5 watts. I will bump it up for simplex if I need to. 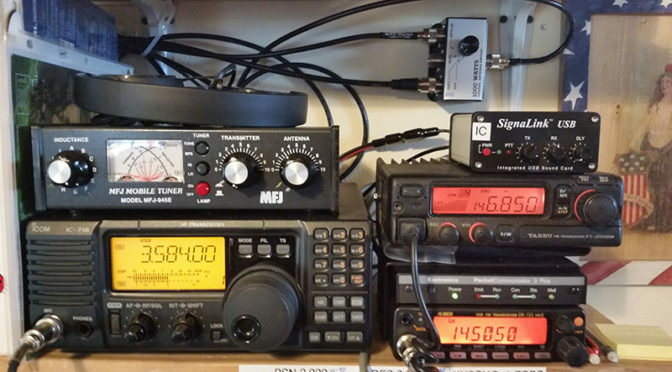 The HF station is an Icom IC-718. I have the Hy-Gain AV-18VS vertical which I have been using for 40-10 meters. It will tune up to 80 meters, but the 80 meter wire NVIS I built is more effective for 60-160 meters. I have both antennas switched into an MFJ-945E tuner and on to the radio. I have been making regular 75 meter contacts from Canada to California and east to Idaho, Colorado, Nevada, and Utah. I have poked around on 40 and 20 meters but not much. I have been too busy with the NTS nets on 75 meters to go looking for anything else. On the HF digital side, I have the 718 connected to a Signalink USB which works great for Winlink Winmor peer-to-peer and CMS connections as well as a wide variety of digital modes through fldigi. I am looking for another HF radio to dedicate to digital modes, and I recently picked up a Kantronics KAM-XL which has VHF/UHF and HF ports that would allow me to set up access to my PBBS on HF as well as VHF and cross-band digipeating, but that’s for the future. My next area of attention is to get an old KPC-3 connected to an inexpensive VHF/UHF radio I already have and install them in the truck for mobile packet access. I may be able to work out an APRS system while I’m at it. Well, that’s it for now. I’ll try not to wait for 4 months to update next time. Previous PostMuch Goings OnNext PostThe March Review?